With over a thousand cars and exhibits on display, The New York International Auto Show needed a central digital destination where fans could learn about the show and keep coming back for more. In addition to showcasing the vehicles, it needed to incite engagement among fans online and in-venue. The Buzz Index is a real-time gauge for what’s trending at the Auto Show at any given moment. Behind the scenes, the site integrates with a listening platform that monitors millions of social and press mentions to determine what vehicles and exhibits are trending around the world. The front-end presents a “dashboard” that spotlights the most popular cars and changes as rapidly as the trends, slickly optimized for desktop, tablet and mobile. Users can find out more about every exhibit, including manufacturer information, relevant headlines, fan tweets, and Instagram photos. In 2014, we took the Buzz Index to another level when we created a Google Street View experience of the entire Auto Show, allowing visitors to view every floor and car from their computer, including 360 degree views of several car interiors. 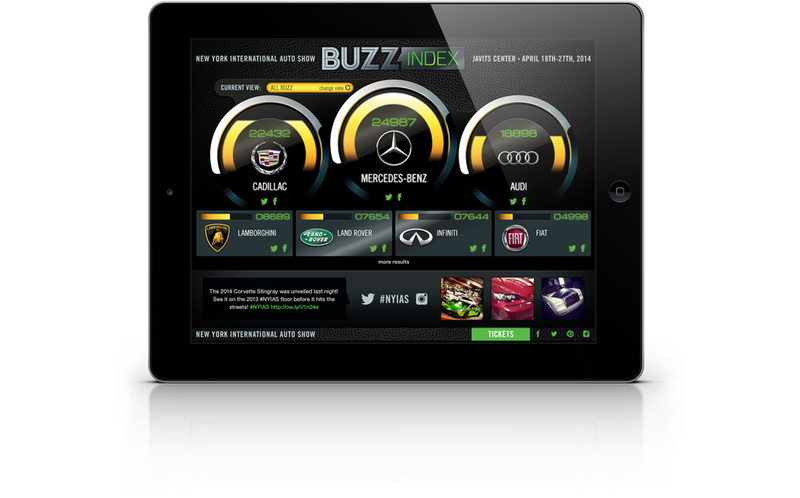 The Buzz Index represents a depth of social experience never before created in the auto industry. A very happy client, 50,000+ views, 200,000+ shared impressions, and thousands of visitors at the in-venue Buzz Index installation.